Sam Bowersox-Daly got a double-dose of Boettcher during one of his earliest assignments in the Boettcher Teacher Residency. 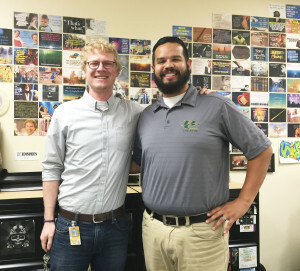 Sam, a 2010 graduate of Colorado State University, was selected for the Boettcher Teacher Residency following five years with The Global Livingston Institute and Apple Inc. He is currently teaching social studies under the guidance of mentor teacher Cyndi Gentile at Bear Creek High School in Lakewood. Since mentorship and hands-on classroom learning are cornerstones of the Boettcher Teacher Residency, Sam was asked to observe other teachers in his department. That project took him into the classroom of Jose Martinez, a 2003 Boettcher Scholar and member of the Boettcher Scholar Alumni Board. Sam’s observations offered powerful insight into what makes a great teacher. “Jose is a teacher that goes above and beyond to elevate his own teaching and to help others improve their practice,” Sam said. Jose, a graduate of the University of Northern Colorado, isn’t just any teacher. He was recognized with a Milken Educator Award in 2013. The award honors the top educators throughout the country. In addition, Jose was a finalist for the 2015 Colorado Department of Education Teacher of the Year Award. When Sam observed Jose’s class, Jose was teaching a freshmen honors course. Students were in the midst of making Facebook profiles for well-known government philosophers. 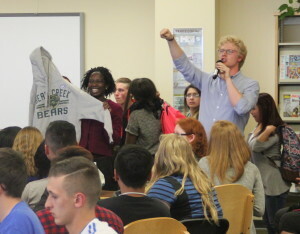 “I immediately noticed Jose’s use of collective voice to bring the class together, discussing their work from days before and framing the agenda for the day,” Sam recalled. Jose is eager to guide new teachers and said he feels a special kinship with Boettcher Teachers. Sam in class with a guest speaker. If Sam’s experience is any indication, Jose is well on his way to doing just that.